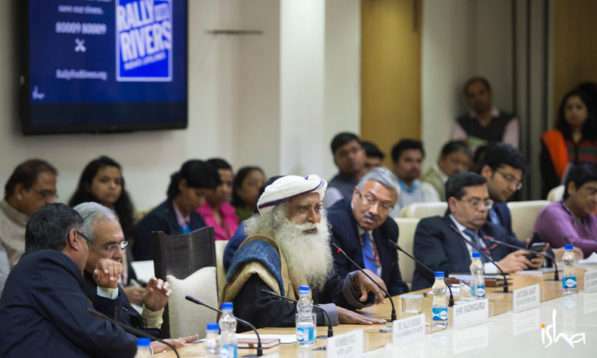 With the support of 162 million people, Rally for Rivers became one of the largest ecological movements. 13 Chief Ministers from different political parties participated in the RFR events that happened in 16 states across the country. For the first time ever, political parties of varying ideologies converged for a common purpose – to salvage the dying rivers of the nation. In addition to political leaders, top level bureaucrats, film stars, farmer leaders, sports icons, artists, environmentalists, scientists, corporate CEOs, industrialists, agriculture universities and many more also came together in support of the campaign, which made it a phenomenal success. So What Has Happened Since the On-road Rally Ended? 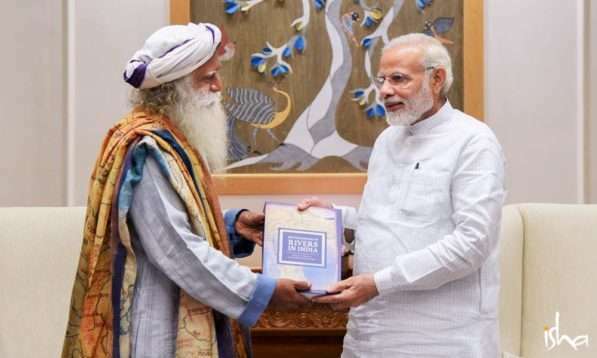 After the rally ended in New Delhi, on October 2nd, Sadhguru met the Hon’ble Prime Minister, Shri Narendra Modi, and handed over the river revitalization draft policy recommendation to him. The PMO has formed an executive committee with Secretaries from the Ministries of Agriculture, Environment and Forest, Water Resource, Rural Development and Urban Development to come up with an actionable plan that the Government should take up at the state and central levels. Isha Foundation was part of the first meeting where the gamut of recommendations was presented. Following this, NITI Aayog (the policy think tank of the Government of India) had consultations with other experts and submitted its recommendations to the PMO in the month of February, 2018. 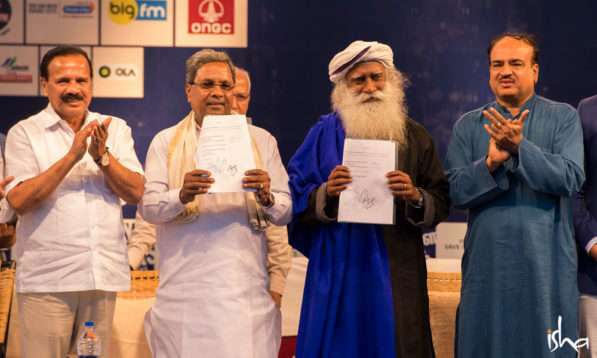 Meanwhile during the course of the rally and afterwards, Isha Foundation signed MoUs with governments from 6 states of India – Maharashtra, Karnataka, Punjab, Gujarat, Assam and Chhattisgarh. The Government of Maharashtra plans to plant 50 crore trees across the state, with a special focus on improving the green cover along the lands close to rivers. The Government of Karnataka has committed to plant 25 crore trees across the state with a special focus on riparian lands. Additionally, the Ministry of Water Resources and the Ganga Rejuvenation program has committed to plant 10 crore trees along the lands of the river Ganga. Since the first MoU was signed with the Government of Maharashtra on 1st July 2017, two districts in the state – Yavatmal and Pune – were identified to implement the pilot project. The approach that focuses on source augmentation of rivers through tree plantation has been seen to improve farmers’ livelihoods. In view of the above, Isha Foundation is preparing a Detailed Project Report (DPR) which outlines the agro-climatic condition, choice of tree crops, feasibility of community micro-irrigation, current crops grown, transition strategy, marketing of existing produce, marketing for proposed crops, among other aspects. Fundamentally, the whole project will be executed through Farmer Producer Organizations (FPOs), which is the cornerstone of the project. All such aspects will be covered in the DPR. 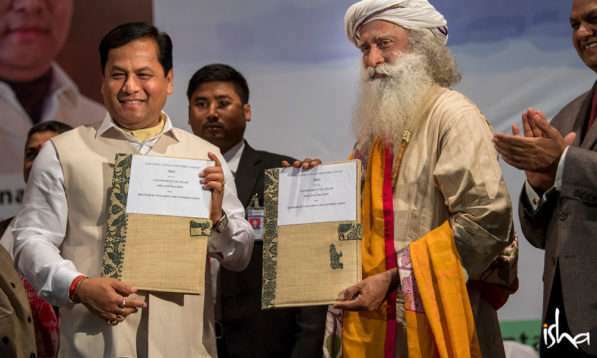 Isha Foundation has presented a broad outline of the DPR on March 7 to the Government of Maharashtra and by the end of June, the finalized document will be submitted for approval. Following the approval, activities will start on the ground. RFR had meetings with the Government of Karnataka to discuss the implementation strategy by adopting a pilot project in the Kaveri river basin. At present, the river selection is in process. Once this is done, a DPR will need to be prepared and steps undertaken for Karnataka, similar to the way it has happened in Maharashtra. Karnataka Bank has committed its complete support in rejuvenating a river in association with RFR and the Govt. of Karnataka. To start with, Karnataka Bank is funding the preparation of the DPR for the pilot project. 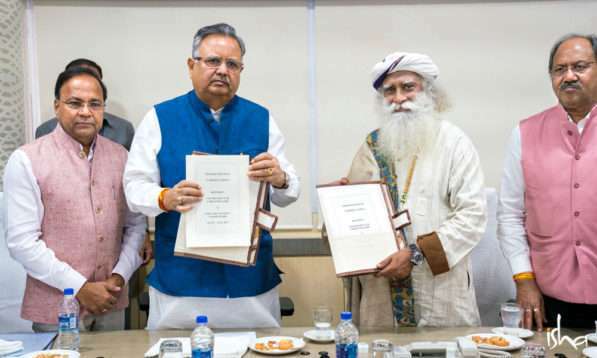 Following this, in all the other four states, Isha will be playing a role as a consulting and technical partner in implementing the river rejuvenation program. 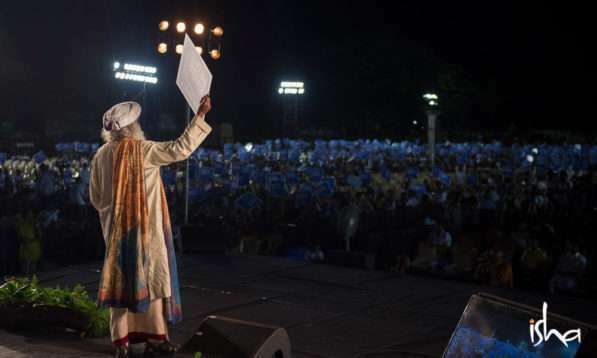 During the rally, Sadhguru made a clarion call to the youth of India, urging them to support this project. Nearly 6,500 people from all over India registered to join Rally for Rivers as full-time and part-time volunteers. After several rounds of telephonic and personal interviews, the first 100 volunteers were selected and invited to move to the Isha Yoga Center in the month of January 2018. 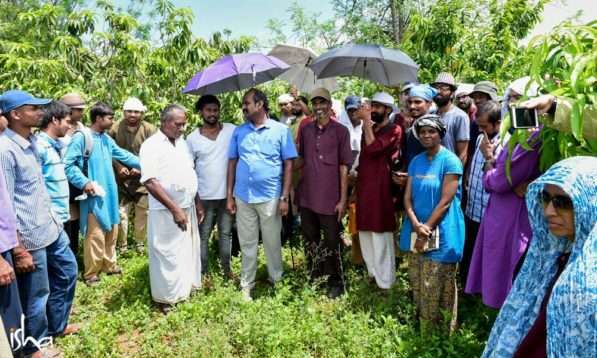 Known as Nadi Veeras, which is Sanskrit for “river champions”, they have come from more than 15 states of India and have devoted themselves to making a difference to the environment and reviving India’s lifelines. The Nadi Veeras have committed to stay with the project for the next 3 years as full-time volunteers. 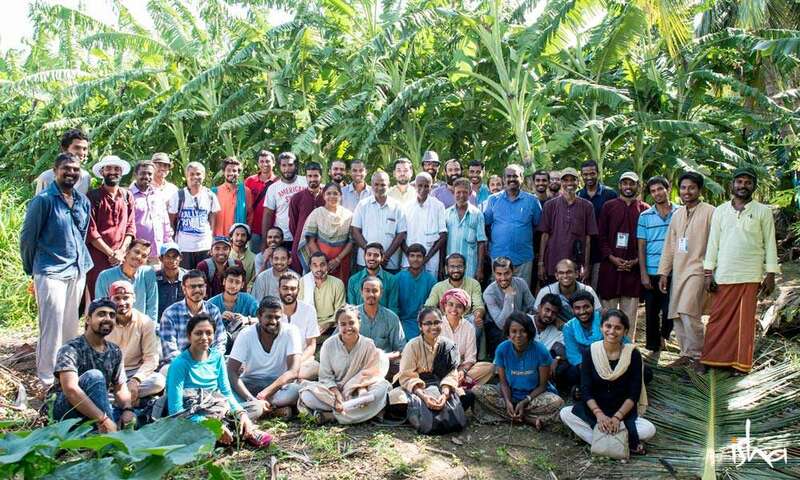 The Nadi Veeras underwent a 3-week orientation program at Isha Yoga Center, which was then followed by training workshops on technical aspects of the project. Since the volunteers are from all walks of life, our focus has been on equipping them with relevant information and building their knowledge and competence in the core aspects of the project. In this regard, the Nadi Veeras were introduced to national level experts from across India. Experts from the fields of soil science, agriculture, horticulture, community micro-irrigation, watershed development, GIS-based monitoring, integrated rural development, policy making, agri-produce marketing, community forest rights, organic farming, tree-based agriculture, livestock, hydrology and other areas were invited as resource leaders to share their experience in their respective areas. Tamil Nadu Agriculture University and the Forest College and Research Institute have also joined as training partners for a few of these aspects. The first phase of these technical training programs ended on 30th April and following this, the Nadi Veeras are scheduled to work in all the 6 states where MoUs have been signed.